Over the past decade, increasingly relaxed censorship rules on basic and pay cable channels have allowed for grittier cop dramas than one can see on regular broadcast television. Excellent shows like The Shield and The Wire opened the floodgates. That trend continues today with shows like Southland. By contrast, big screen police procedurals have dwindled in number over the last ten years. During such time, writer/director David Ayer has been keeping the genre alive with films such as Street Kings. 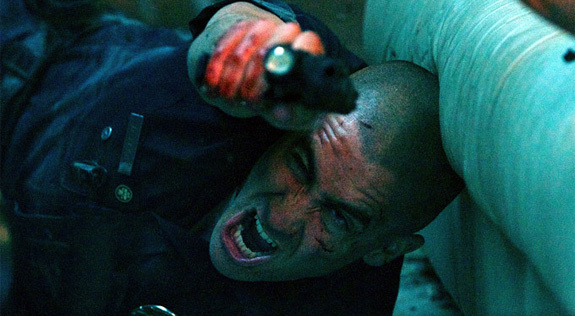 His latest, End of Watch, pairs the cop film with the found footage genre. End of Watch tells the story of Los Angeles police officers Taylor (Jake Gyllenhaal) and Zavala (Michael Pena). The two young cops consider themselves brothers in arms, and have a blast running and gunning on the streets of south central. All seems good with the world, until the Mexican cartels put a “green light” out on the both of them. As all Hell breaks, Taylor and Zavala’s mettle is put is to the ultimate test. End of Watch is perhaps the first cop flick to make use of the “found footage” aesthetic. Ayer has no doubt employed it to lend this film an air of realism and legitimacy. While that may have been achieved, something was surely sacrificed in the attempt. It looks indistinct from its basic cable counterparts. Much more interesting is the trailer’s narrative. The streets are punishing this pair of arrogant young cops for their hubris and ambition. The trailer ends with Taylor and Zavala being pinned down by gunfire after chasing a suspect into a housing complex. It’s reminiscent of The Raid: Redemption, though in this case it seems as though the protagonists have earned their fate. Gimmicks aside, if David Ayer’s artistic tunnel vision yields a unique take on an old standard, I’m up for it.